Highest read and write speeds possible through a USB port. Up to 5 Gb/s transfer rate. Dual compatibility means you can use it with your USB 3.0 devices, as well as any USB 2.0 devices. Fully compatible with the newest generation of WD's My Book Essential and My Passport Essential external hard drives with USB 3.0 interface. Cons: Can't support USB-powered HDD (since it doesn't have its own power feed like some other cards do). Pros: Works with every OS I've thrown at it. I bought one of these nearly a year ago and put it in my N40L MicroServer and it works great with every OS I've thrown at it from S2003 up to S2012 and S2012E as well as the desktop OS's. Got a 2nd card when I got my 2nd N40L -- the card just works. Plan to get a third to add extra USB 3.0's to my X58 when I move it to Win8. Other Thoughts: With the S2012 and Win8 family you don't even have to load the WD drivers. Originally ordered this to pair with my Segate 4TB external GoFlex -- I liked the irony of pairing a WD with a Seagate -- Really impressed by the card after that! Pros: It just works with no driver issues. Ordered two, one went into a Dell 2900 III server with Windows 2008r2, the other other into a Dell dimension 9200 with Win7. Both systems worked great plugging in the http://www.newegg.com/Product/Product.aspx?Item=N82E16822236385 WD 4tb drive, speed increase over usb2 was excellent. Next was http://www.newegg.com/Product/Product.aspx?Item=N82E16820191384 and it worked awesome, this flash card is just super fast over usb3 with writes at 55MB/s, reads at 115MB/s by just doing to basic file copy operations. Other Thoughts: Wished there was a 4 port card. Usable storage is a tad over 3.6tb. Backup software included is fairly basic. The usb ports themselves appear to be lighted, not sure the real purpose. Pros: I have searched for months for a faster USB solution for my EVGA X58 SLI 3 board which only had USB 2.0 capabilities. This USB 3.0 card worked right from the start and sped up my Seagate 3 TB Expansion drive from 15 MB/sec to 60 MB/sec. Sweet! Pros: The card is amazingly fast. Even though there are a few things that could be better (see below), the speed alone merits five eggs. I am using this with a Seagate Expansion 3 TB USB 3.0 external drive. The first thing I did was start a transfer of nearly 2 TB of lossless ALAC files to back up my iTunes library. From my internal RAID 5 (Four WD Black 1 TB drives) array, this transfer *averaged* 160 MB/sec! I began the transfer using TeraCopy before going to bed and it was completed well before I woke up. On a USB 2 external drive, this would have taken DAYS since I rarely average more than 25-30 MB/sec. Doing other transfers, I have seen maximums approaching 200 MB/sec and even the "slow" transfers (lots of small files) are around 50-60 MB/sec. The white lights next to the ports are great for me, but could be distracting for a gaming rig in the dark. I have purchased over 100 hard drives made by WD (so inevitably some have failed and I've had to RMA) and any time that I have dealt with their customer service, it has been quick and painless. 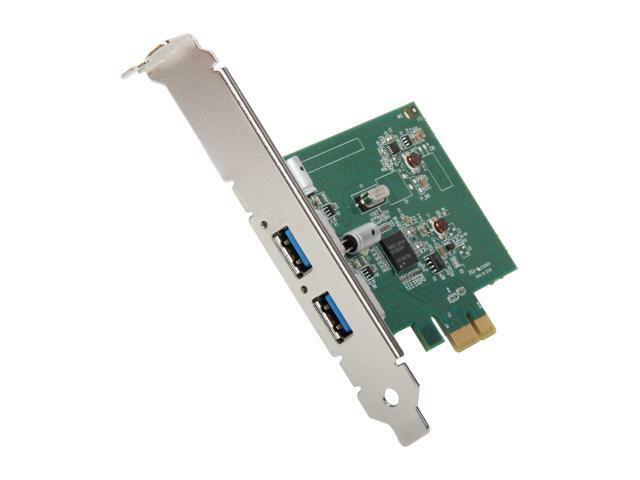 Card works great in Windows 7 x64 and Windows 8 x64. Again, the lights I listed as a pro; could be a distracting con for some. It would be nice if the card had an internal header. Other Thoughts: The only problem I actually had with this card is the length, and I won't fault the card. I have a Gigabyte GA-EX58-UD4P board (Socket 1366) and the card was about 1/2" too long to fit in the PCIe slot due to a large heatsink not far behind the slot. Fortunately, the card does work (and very well I might add) in an open PCIe x4 slot. Pros: No additional power needed, small LED lights illuminate sockets making it easy to see in dim areas, fast USB 3.0 speeds in a small form factor. Cons: Had to manually install one of the drivers from the disc on SBS 2011 Essentials. Not really a big deal if you know what you are doing, but it's an extra step. Other Thoughts: Added this to an office server that didn't have USB 3.0 so the automatic backups could be processed faster. Installed quickly, even with the need to manually find the missing driver (WD SES) and install that. Cons: wish it had a stake header to plug into my front usb ports.